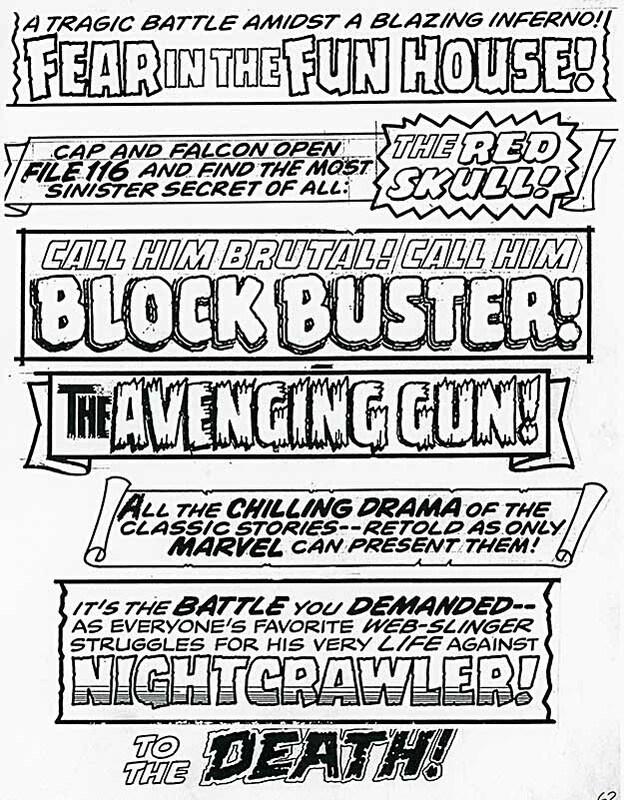 Continuing my exploration of the cover lettering work of Danny Crespi at Marvel Comics from about 1974 to the early 1980s, with some examples from others. 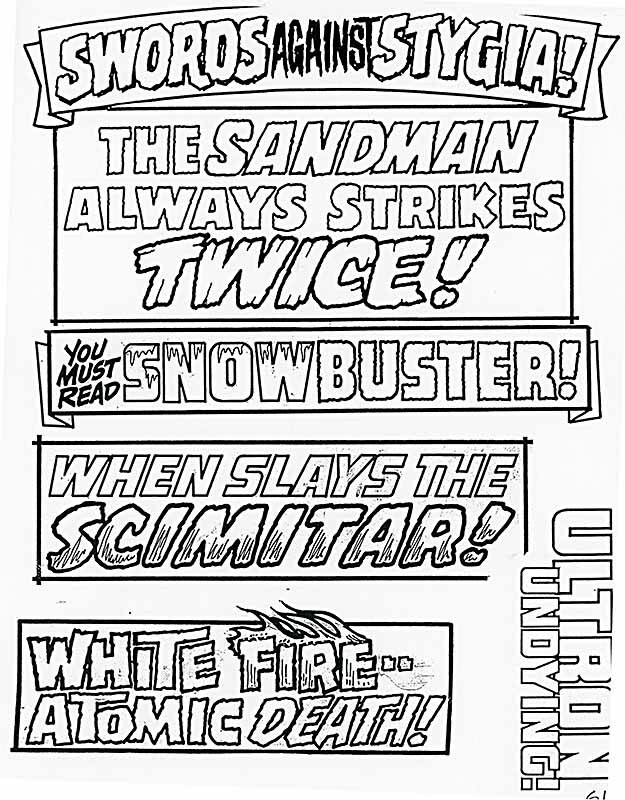 Photocopies of saved cover lettering from Danny’s files were compiled into a collection by letterer and friend Phil Felix during the 1980s when he worked with Danny on staff at Marvel, and Phil sent me copies. This time I’ll look at pages 61-64. 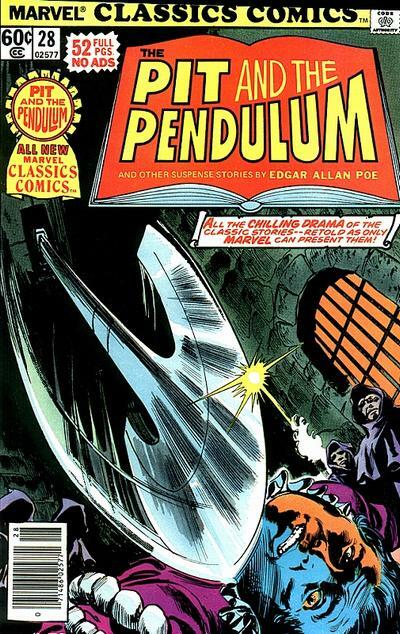 Page 61 is above, all lettered by Crespi except Ultron Undying, which is probably by Jim Novak. Sources below. 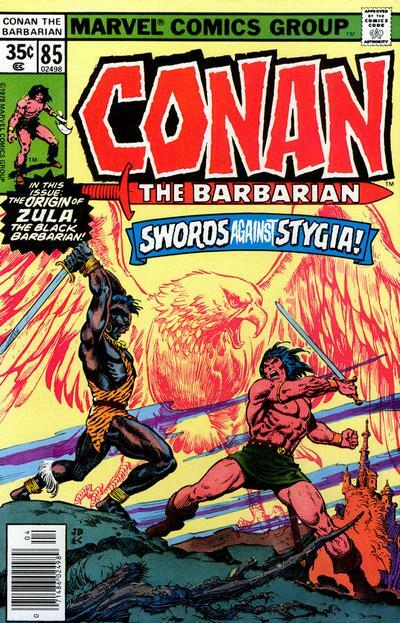 “Swords Against Stygia” from CONAN #85, April 1978. Danny’s lettering on the banner looks great here, the word AGAINST reversed in white on the dark blue background, and a nice contrast from the reds around it. 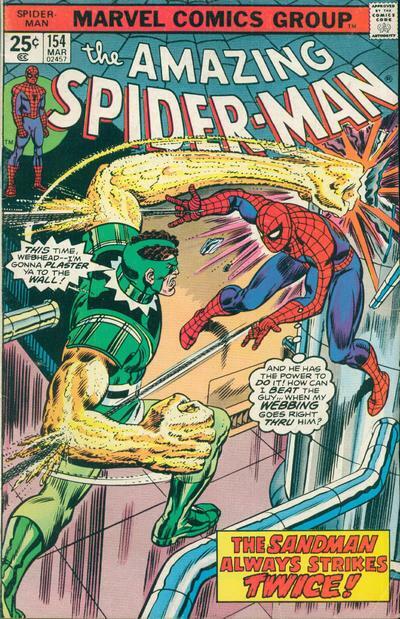 “The Sandman Always Strikes Twice” from AMAZING SPIDER-MAN #154, March 1976. The extra lines in TWICE give it just enough texture to stand out. 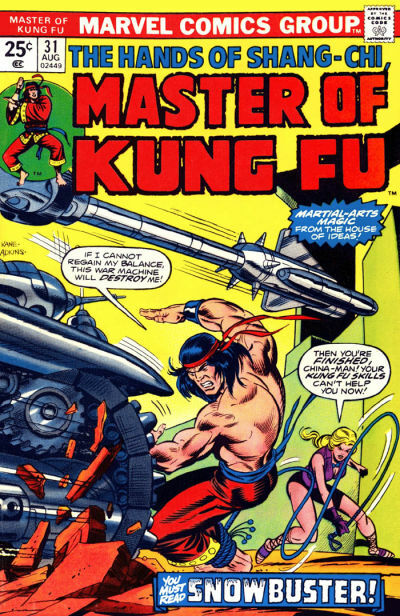 “Snowbuster” from MASTER OF KUNG-FU #31, Aug. 1975. Another nice banner that follows the same plan as the first one above. 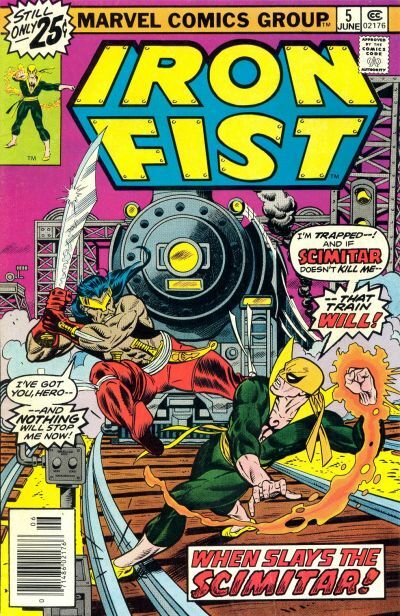 “Scimitar” from IRON FIST #5, June 1976. This caption works perfectly well, but I think making the word SCIMITAR sharp-edged, or even putting a blade behind it would have been a better option. “White Fire, Atomic Death” from BLACK GOLIATH #2, April 1976. On the other hand, flaming FIRE here fits the bill perfectly. “Ultron Undying” from AVENGERS #202, Dec. 1980. 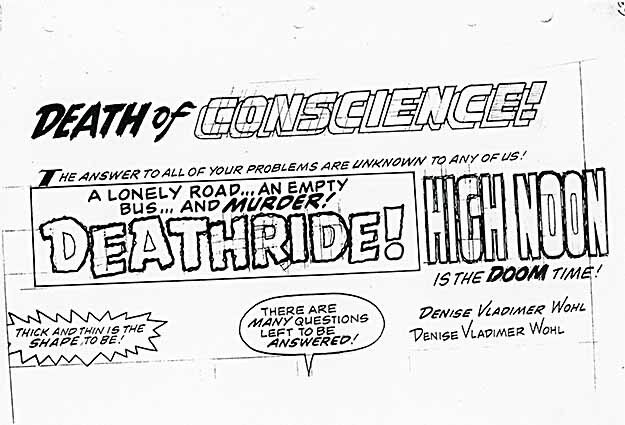 This would be late for Danny, who was mostly done with cover lettering by 1980. Gaspar Saladino would be a possibility, and Gaspar’s closest clone, Jim Novak an even better one. That’s my guess. Note how the notch on the right side of the R is not centered on the central horizontal stroke. That’s something Gaspar always did, and Jim copied it. Page 62 of the Crespi Files, all lettered by Danny except the bottom one, which is by Gaspar Saladino. Sources below. 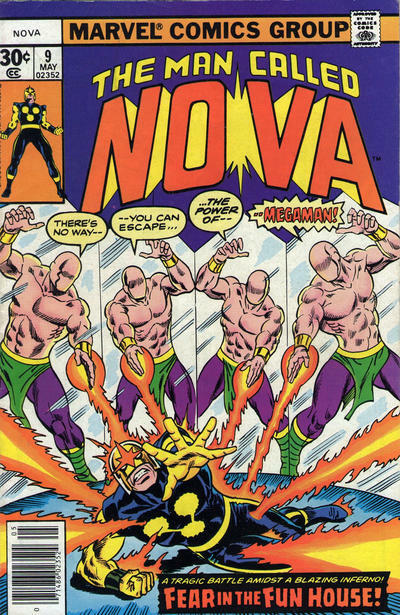 “Fear in the Fun House” from NOVA #9, May 1977. The black fill behind the lettering in this caption does not help it. Danny’s open lettering outlines tend to be on the thick side, and when they are filled around with black it makes the letters seem a bit too thin or small. The original lettering looks better. 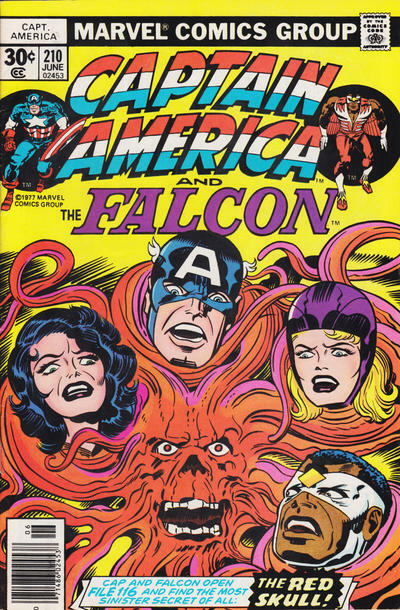 “The Red Skull” from CAPTAIN AMERICA #210, June 1977. I don’t care for the blue lettering in this one, but it reads fine. Again, the black fill around the open lettering makes it look less good than the original. “Blockbuster” from OMEGA THE UNKNOWN #7, March 1977. This caption works fine. Putting it over a figure is not a great idea, but there are few options on this busy cover. 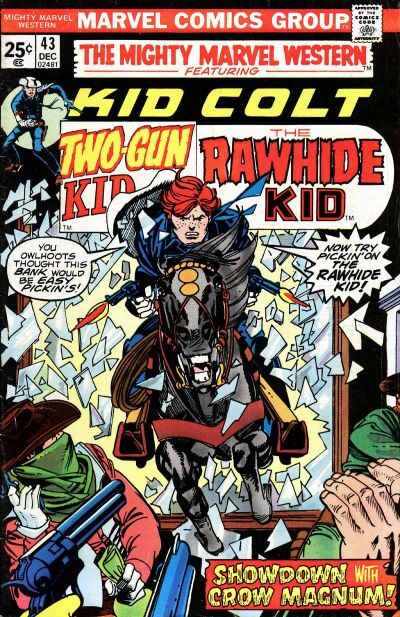 “The Avenging Gun” from KID COLT OUTLAW #222, Feb. 1978. 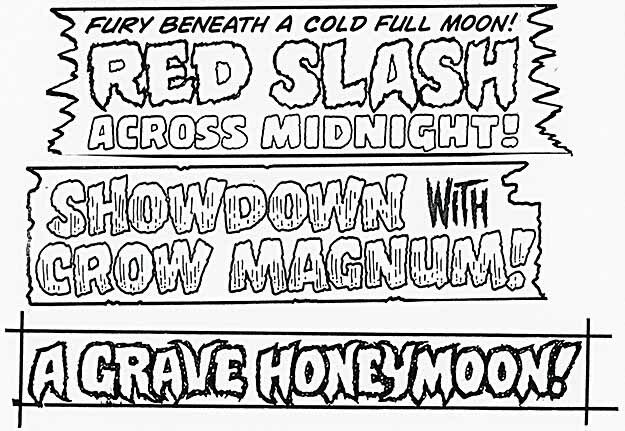 The rough and ragged-ended letters on the main words in this banner work really well here, adding excitement, at least to my eyes. 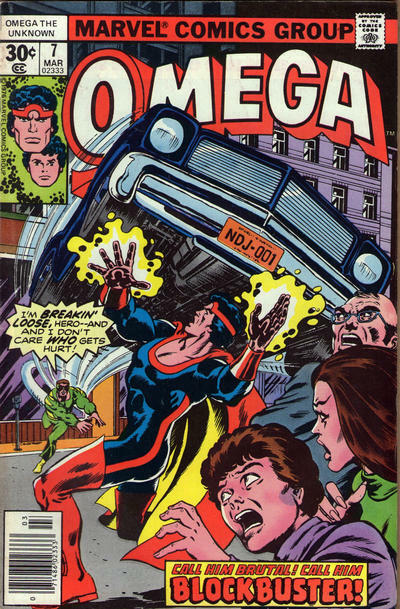 “Chilling Drama” from MARVEL CLASSICS COMICS #28, 1977. It’s likely Danny also lettered the story logo, which I think works well. 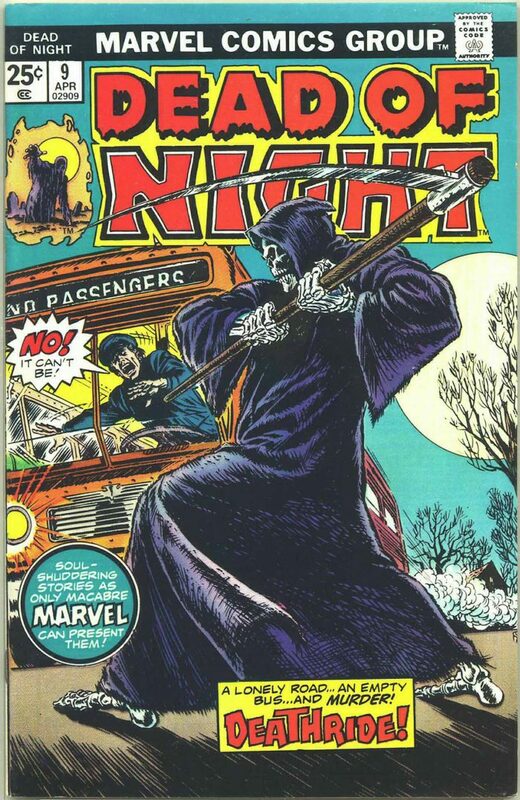 These Marvel versions of the old Gilberton “Classics Illustrated” series always seems like an odd hybrid to me, but the cover lettering helped it seem more of a Marvel comic. “Nightcrawler” from AMAZING SPIDER-MAN #161, Oct. 1976. The rough interior of the word DEATH made of broken lines and dots from a Speedball B5 or B4 pen with the thin outline around it says Gaspar Saladino to me. I’m surprised I was able to find this partial caption, but I did. …you’ll see the one by Denise is different. Perhaps she was copying some of Danny’s cover lettering in hopes of doing some herself, and possibly with Danny’s help. 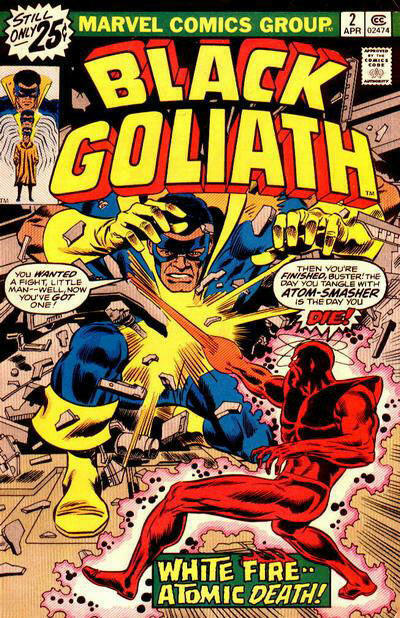 Denise’s credits as a letterer for Marvel run from 1972-1976, and cover about 116 issues. In 2007 she was involved in creating a comic about Kabbalah called SEVEN, written by Jim Shooter. Only one issue came out. That’s all I know about Denise. Anthony Tollin adds: Denise Vladimer was working in DC’s production department during the first couple years I worked at DC. She occupied the desk that Steve Mitchell had during the years you were working in production. Thanks, Tony! That would put her on staff at DC in the early 1970s. Michael Wm. 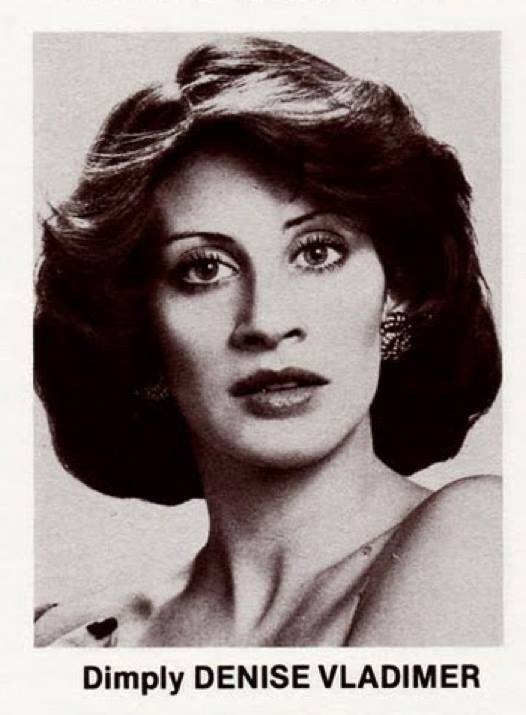 Kaluta provided this picture of Denise from her time at Marvel, probably from one of those pages with lots of creators on it that they sometimes ran. Page 64, all by Danny. The bottom one also appeared on page 51. Sources below. 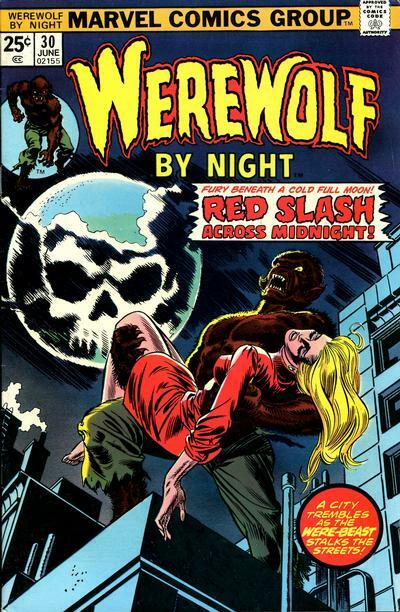 “Red Slash” from WEREWOLF BY NIGHT #30, June 1975. The writer or writers of these cover blurbs is generally unknown, but it was often done by the editor of the book, or sometimes the assistant editor or writer (if that person was around at the right time). This one is chilling, and very effective in red. 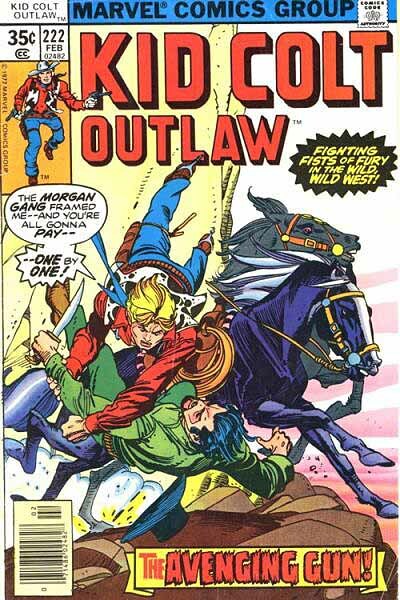 “Showdown” from THE MIGHTY MARVEL WESTERN #43, Dec. 1975. 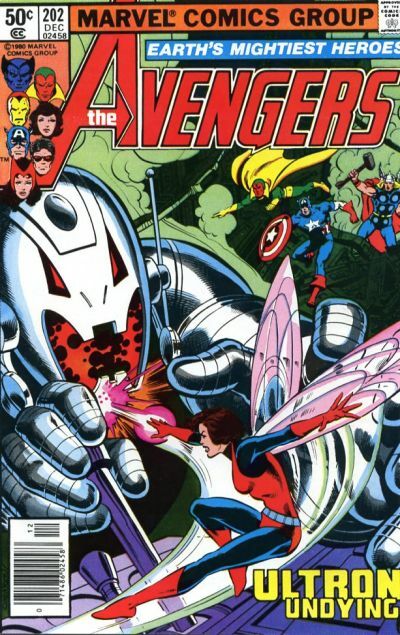 Here’s a cover where more than half the space is taken by the trade dress, logo and lettering. 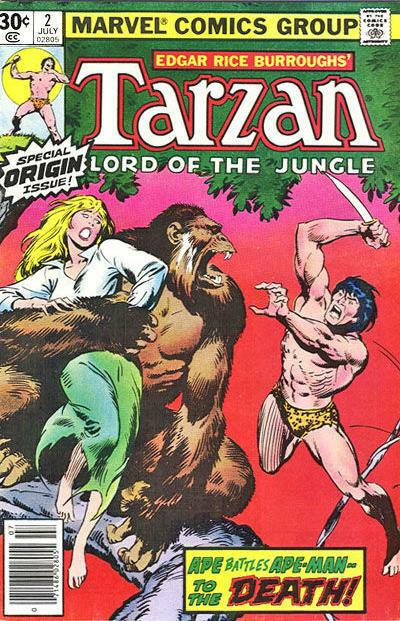 Artist Gil Kane still manages to make it work well, and Danny’s caption with the textured lettering helps too. 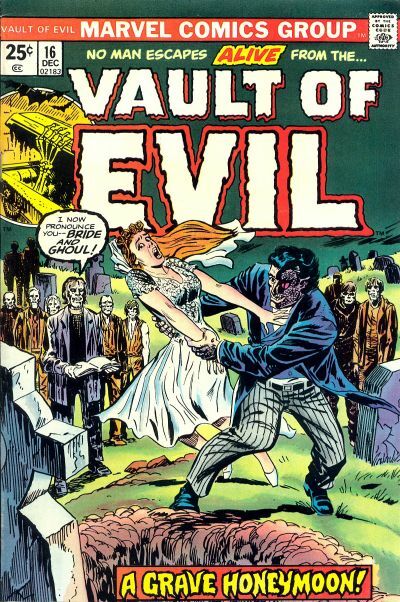 “A Grave Honeymoon” from VAULT OF EVIL #16, Dec. 1974, also seen on page 51 of the Crespi Files. Very readable, but otherwise not one of Danny’s better efforts in my opinion. More of these when I have time to research them. This entry was posted in Danny Crespi Files, Lettering/Fonts on August 14, 2018 by Todd.